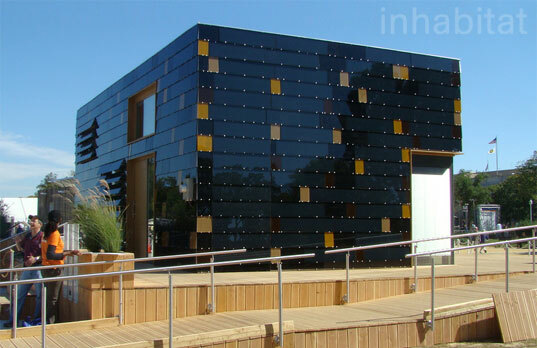 Germany’s Solar Coated surPLUShome Wins Solar Decathlon! The final results just rolled in from this year’s Solar Decathlon, and team Germany’s sleek surPLUShome finished first in an incredible upset victory! The German team took top honors in the Net Metering and Engineering categories this morning, steamrolling the competition to secure their second Decathlon win. This year’s home features a sleek, dark facade that is almost completely covered in photovoltaic panels and can provide more than twice the amount of energy it needs. Check out our cool video from America.gov about the house after the jump! A far cry from the Team Germany’s 2007 entry, the surPLUShome pushed the envelope in every respect, from the use of new technology to non-traditional architecture. The competition really came down to solar production and energy efficiency, with the goal of designing and building a net zero home. So it’s really no surprise that Germany was victorious, considering their very rigorous and impressive Passivhaus building standard. Team Germany, made up of 24 students, hails from the Technische Universität Darmstadt and achieved great marks in all of the categories, scoring a total of 908 points out of a possible 1,000. Team Illinois won 2nd place with 897 points, while Team California, favored to win earlier this week, took 3rd place with 863. Congratulations to all of these teams on their incredible projects! We hope that many of the technologies and advances in design we saw during the Decathlon will filter out into commercial and residential homes around the world. This house cost about 900k to make. I'm not sure how much it would cost on the market. There were other houses that were constructed at much lower costs, 150k to 300k, with an expected market price of 80k to 230k. Check out solardecathlon.org and look at the team videos. There were a few amazing, affordable homes. If i could get a brake down of how everything was sourced and constructed, I would start saving my $400,000 immediately. the average cost of the houses in the competition was $400,000. I assume this house was on the higher side of the average. the average cost of the homes in the competition was $400,000. I wonder if we can get any idea in respect to cost? Germany's Solar Coated surPLUShome Wins Solar Decathlon! The final results just rolled in from this year's Solar Decathlon, and team Germany's sleek surPLUShome finished first in an incredible upset victory! The German team took top honors in the Net Metering and Engineering categories this morning, steamrolling the competition to secure their second Decathlon win. This year's home features a sleek, dark facade that is almost completely covered in photovoltaic panels and can provide more than twice the amount of energy it needs. Check out our cool video from America.gov about the house after the jump!